Rooster water color original by Amie Kieffer. Set of 20 cards size 4.25"x 5.5" with French Paper Kraft Brown Envelopes. Blank inside - perfect for Cursillo, thank you's, birthday, anything. Back includes a description of the Christian symbolism of the rooster. 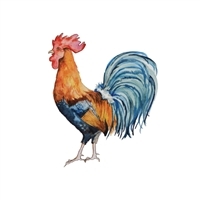 Masculine and alert, this rooster is resplendent.